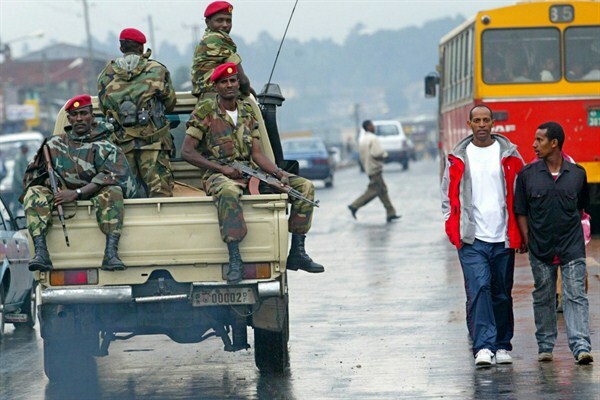 In this June 10, 2005 file photo, Ethiopian soldiers patrol the streets of Addis Ababa, after clashes with protesters (AP photo by Karel Prinsloo). ADDIS ABABA, Ethiopia—In Ethiopia’s two most populous ethnic regions, anti-government rallies turned into a bloodbath in early August as security forces again used live ammunition against protesters. In the western part of Oromia, the largest of Ethiopia’s nine ethnically based states, the town of Nekempte looked like a “war zone,” according to a protester. An opposition party said almost 100 people were killed and thousands arrested after demonstrations across the sprawling Oromia region, which encircles the capital, Addis Ababa, and borders Kenya in the south and South Sudan in the west. A day later in Bahir Dar, the capital of Amhara state, Amnesty International said police killed as many as 30 people. The government said a protest descended into a riot. Historic Gondar city to the north also saw more demonstrations, vandalism and repression.